TIME STANDS STILL, Broadway’s best reviewed new play, begins its final two weeks of performances tonight at 7 PM. The play stars recent Golden Globe Award winner Laura Linney (“The Big C”), Brian d’Arcy James, Eric Bogosian, and Christina Ricci. The production will play its final performance, as previously announced, on Sunday, January 30 at the Cort Theatre (137 West 48th Street). The play is written by Pulitzer Prize winner Donald Margulies and directed by Tony Award winner Daniel Sullivan. Below is a sampling of what other critics had to say about the production: “intensely moving” (Entertainment Weekly), “smart, funny, touching and very wise” (Bergen Record), “Under Daniel Sullivan’s sure-handed direction, the cast is uniformly excellent. A perfectly-pitched quartet.” (The Daily News), “The performances of Laura Linney and Brian d’Arcy James are intensely felt – and intensely fine. They are superb.” (The New York Times), “The cast is shamelessly watchable.” (Newsday), “Christina Ricci makes a highly impressive debut.” (Hollywood Reporter), “Eric Bogosian is excellent.” (NY1), “The cast has gotten even better.” (The Hollywood Reporter), “Dan Sullivan’s direction is incisive.” (Newsday) and “Donald Margulies outstanding play is even more satisfying on second viewing.” (Bloomberg News). TIME STANDS STILL follows Sarah and James (Laura Linney and Brian d’Arcy James), a photojournalist and a foreign correspondent trying to find happiness in a world that seems to have gone crazy. Theirs is a partnership based on telling the toughest stories and together, making a difference. But when their own story takes a sudden turn, the adventurous couple confronts the prospect of a more conventional life… and everything changes – in a flash. Before re-opening at the Cort, TIME STANDS STILL enjoyed an extended sold-out run at Manhattan Theatre Club’s Samuel J. Friedman Theatre. The production was honored with Tony and Outer Critics Circle nominations for Best Play and Laura Linney was recognized with nominations for Best Actress by the Tony Awards, the Drama Desk Awards, The Outer Critics Circle Awards, and the Drama League. Tickets range from $26.50 – $121.50 with premiere seating available from $176.50 – $251.50 with standing room (when available) at $26.50. Tickets include a $1.50 facility fee. Tickets are available through Telecharge.com, by phone at 212-239-6200, or 800-432-7250, online at www.Telecharge.com or at the Cort Theatre Box Office (138 West 48th Street). TIME STANDS STILL is produced by Manhattan Theatre Club Productions; Inc. (Lynne Meadow, Artistic Director; Barry Grove Executive Producer); Nelle Nugent; Bud Martin; Ted Snowdon; Wendy Federman; Max Cooper; Susanne Adamski; Mari Nakachi; Jack M. Dalgleish; Joseph Sirola; Elisabeth Morten; Kenneth Teaton; and Sharon A. Carr. The creative team includes John Lee Beatty (scenic design), Rita Ryack (costume design), Peter Kaczorowski (lighting design), Darron L West (sound design), Peter Golub (original music), and Thomas Schall (fight direction). NOW THROUGH SUNDAY, JANUARY 30: Tuesday 7PM, Wednesday 2PM & 8PM, Thursday 7PM, Friday 8PM, Saturday 2PM & 8PM, Sunday 3PM. 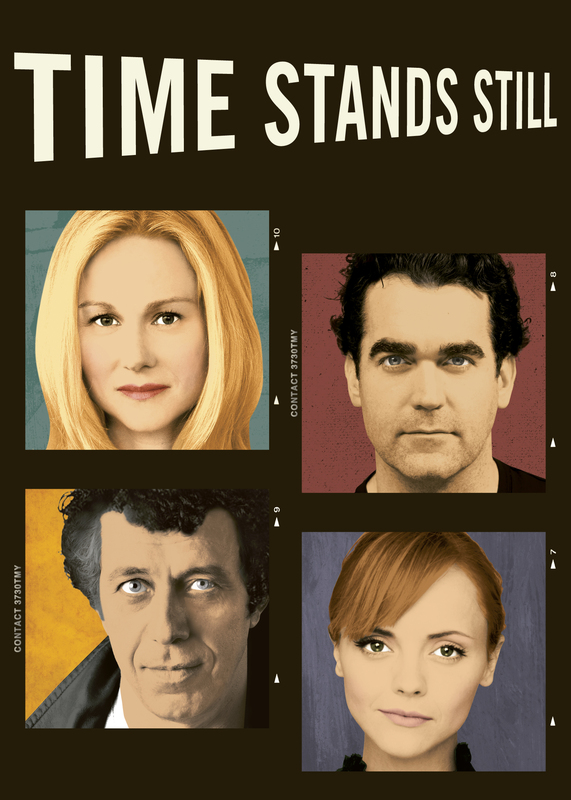 TIME STANDS STILL, Broadway’s best reviewed new play, will end its acclaimed run when stars Laura Linney, Brian d’Arcy James, Eric Bogosian, and Christina Ricci depart the production, as scheduled, on Sunday, January 30 at the Cort Theatre (137 West 48th Street). The play, by Pulitzer Prize winner Donald Margulies and directed by Tony Award winner Daniel Sullivan, recently announced the lauded cast had extended their run at the Cort, through January 30. When it closes on that date, the production will have played 16 preview performances and 126 regular performances. TIME STANDS STILL, the Tony nominated hit play at the Cort Theatre (138 West 48th Street), continues its talk back series Tuesday, December 7 following the 7 PM performance with an edition sponsored by the Associated Press. An Associated Press team of journalists led by AP Director of Photography Santiago Lyon will discuss the rigors of international coverage of the news in the world’s hotspots during the digital era. Lyon, the moderator, and his panel of AP journalists have a wide range of experience telling the toughest stories from the toughest locales for a global audience. With more than two decades of experience in news service photography and multiple photojournalism awards for his coverage of conflicts, Lyon knows what questions to ask about ethics, relationships and journalism. For Lyon, AP’s mission as a news organization is to cover events as accurately and faithfully as possible and leave the interpretation of the content – whether the storytelling is via text, audio, video or photos – to the audience.